Every pro user is going to be different in their needs. One might have storage-heavy needs, requiring dozens of terabytes of storage, with others needing as many CPUs as possible, and others demanding multiple powerful graphics cards. If you haven't explored the existing Mac Pro in, you can get a refresher from our previous video. It is a good starting point before exploring what could be coming down the pipeline. While Apple has pushed the release date of the redesign back to 2019, here is our list of what we'd like Apple to incorporate into their next-gen pro machine. This one is supposedly coming, though we aren't certain what shape it will inevitably take, or how modular it will in fact be -- or for that matter, what Apple very specifically means by the term. The current cylindrical design is extremely hard to upgrade, with soldered-in or proprietary parts, but can still theoretically be called "modular" if you count the Thunderbolt 2 ports. The dual-GPUs in the machine are still PCI-e based, but require a special design to actually fit and be properly cooled. Really, only the SSD's and RAM are easily swappable for upgraded options down the line. Many loved the "cheese grater" tower design that debuted with the PowerMac G5 and evolved into the Intel-based Mac Pro tower because there was ample room and upgrade possibilities. Graphics cards, additional drives, RAM all could be easily swapped out for many off-the-shelf components. Apple doesn't tend to look back, but we'd prefer some design that is somewhere between the tower-case of old, and the svelte (but impractical) cylinder of 2013 -- and doesn't become a loud wind-tunnel when under load. When looking for graphics -- which many pros are -- most usually look at Nvidia. For the past several years, Apple has adopted AMD cards instead. The reasoning behind the move is complicated, but it stems from a disagreement between the two companies and AMD's willingness to work more closely with Apple. There is rumor Apple is developing their own GPU options, possibly to go alongside their own CPUs, but those aren't slated to hit the scene until 2020 at the earliest. If it were up to us, Apple would be putting in the latest Nvidia GPU's, but we still expect them to choose AMD once more this time around. As a middle ground, Apple could at least choose to use standard graphics cards that are user upgradable. Letting us swap our own cards means we can get longer lives out of our machines, something pros are always looking for. But, we're not sure we're going to get our wish for universal GPU support. While drivers are supplied for Nvidia cards by the company itself, they aren't allowed in the new eGPU support in High Sierra, without third-party hacks which may need to be refreshed after every OS update. Flash storage is once more, a given. We just hope that Apple will upgrade the base storage from 256GB to 512GB. Any pro is going to need more than 256GB. It is borderline insulting that Apple continues to ship such small amounts of storage in their devices, and that should not be the case for a pro machine. Alongside larger amounts of base storage, we also want additional internal SSD slots. This will allow users to continually add additional storage as they see fit. We've heard some people looking for 2.5-inch SSD bays, but personally don't see this as necessary. Third-party manufacturers like OWC have released their own compatible SSDs, making it much easier to find one that would fit. Using the same compact SSDs will also save on space. Ideally, a standard M.2 drive would be the best. But, given that Apple went their own way with the MacBook Pro, and the 6,1 Mac Pro, we're not sure we're going to get what we want. It goes without saying that the latest Mac Pro will be heavily outfitted with Thunderbolt 3 ports. How many is another question. I would expect six to be included, though we'd prefer if Apple upped this to eight. Available PCI-e channels might be an issue -- but more on that in a bit. Those familiar with Thunderbolt know that it can be daisy chained, which could offset some of the need for additional ports. Unfortunately, many third-party accessories don't include the second Thunderbolt 3 port that would be necessary. We have plenty of Thunderbolt hard drives lying around, all that have a sole port, which means if you intend to connect several of them, you need more ports on the Mac. All of the others ports included on the Pro would be welcomed, though we wouldn't be terribly upset of HDMI was removed, as well as two of the USB 3.0 ports. This may be controversial, but with the number of HDMI or DisplayPort to USB-C cables around, there is no need to keep the legacy port in a pro-level machine. We've also moved almost all of our workflow to USB-C over the past year, and many accessory makers have as well. There is still a long way to go, but between new accessories and replacement USB-C cables, USB 3.0 type-A ports are also not as important as they used to be, and will be even less relevant in 2019. Pull the USB-A band-aid off if you're using a desktop. You won't be sorry. PCI-E 4.0 or even 5.0 would be great! A conversation about ports and GPU options has to include a discussion about PCI-e. In October 2017 after a few false starts, finalized the PCI Express 4.0 standard, and supplied specifications to manufacturers. In short, the new technologies allow double the data transfer rate as PCI-e 3, reduced system latency, better scaling for additional lanes, and improved platform integration. This would basically remove any bottlenecks that Thunderbolt 3 currently applies to modern external GPUs when under heavy load. It would also allow for faster or more internal flash storage, as the drives are dependent on high-speed PCI-e channels for the rapid data transfer to and from the computer. Plus, that whole multiple GPU concept would also be enhanced by the adoption of the technology. PCI-e 5.0 is expected to be released in the first half of 2019 and would be faster yet doubling the peak speed yet again -- but we aren't holding our breath, given the time it took to roll out PCI-e 4.0. In the myriad discussions we've had about the Mac Pro, our readers seem to want upgradeable CPUs. However, this has never been something that Apple has explicitly allowed, even if it was technically possible. The G3 and G4 upgrades from the PowerPC 603 and 604 machines were a hack, as were faster G4 processor cards. CPU upgrades for Mac Pro towers, and even the 6,1 cylindrical Mac Pro, were only possible because of the nature of the Xeon processors included, and not by any engineering fiat by Apple. So, there is no chance Apple would willfully allow users to replace the CPU on their machine. That makes it all the more important to launch with the latest CPUs, and be updated frequently. 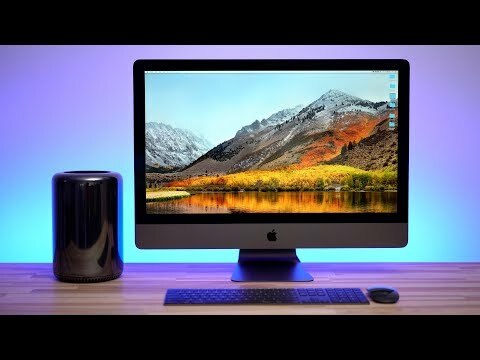 We can look at the iMac Pro for inspiration on what Apple will do with the Mac Pro. The iMac Pro comes in 8, 10, 14, and 18-core Xeon W processors. The Mac Pro should offer at minimum an 18-core configuration, possibly going even higher. Multiple processors is not out of the realm of possibility, either, and a good portion of the Mac Pro line sported multiple processors. Intel has rarely hit its delivery targets for the last few years. What we want to see is the newest, and best, Xeon silicon that Intel can bring to bear. We very specifically don't want Apple using the 2018 chips in a 2019 machine, since we're already waiting for whatever Intel gets around to delivering. There is little doubt that the Mac Pro will be expensive, and understandably so given the Intel processor pricing. The single processor in an iMac Pro is at the very least $1000 and can be upwards of $3300, according to Intel's volume pricing. We're sure that Apple gets a break on this, though. We can see that there is an admittedly small crowd of people who would like the modularity and expandability of a pro machine, even if they don't need the raw power of one. What we are hoping for, is a more affordably priced base model. If the Mac Pro is as upgradable as we hope, there is a chance there will be a more affordable base model that users could upgrade themselves over time. Still, this seems quite unlikely to happen. Money spent on upgrades would go to others besides Apple, something they probably aren't too keen on. Apple discontinued their own first-party displays, recommending third-party monitors to customers instead. They even worked with LG on their Thunderbolt 3 displays. Apple said new Apple-branded displays will be forthcoming. Originally, they were slated to ship in 2018, but there is no official word on whether they too, like the Mac Pro, were delayed until 2019. We are really pulling for both 4K and 5K Thunderbolt 3 displays. Hopefully, Apple also knows that non-pros will be buying these monitors as well, and doesn't price the entire lineup too astronomically. What we'd rather not see is a Thunderbolt 3 monitor with an integrated GPU. Save that for PCI-e enclosures, and keep the costs down on the display. All of Apple's talk, and pre-announcement, of the new Mac Pro has set some lofty expectations for more than just the pro community. Waiting until 2019 to release the machine, as well as announcing the creation of a pro workflow team, has done nothing but spur further speculation and increase anticipation. Whether this is good or bad is up to the reader to decide for themselves -- but you know where we stand on the matter. Regarding the engineering itself, there is always something new on the horizon. It's past time for Apple to set the design, and execute, if it wants to keep any of the "pro" users that are complaining about the state of hardware as it stands. Be sure to check out our other wish lists, including those on the Apple Watch, Siri, HomeKit, and CarPlay. For the record, my 2013 Mac Pro is the best desktop computer I've ever owned. It suits my needs in most ways. I never needed a second GPU but other than that, pretty much perfect though very expensive. 1. One moderately powerful, upgradeable GPU. I don't care AMD or NVIDIA. 2. 8-12 Core Xeon possibly with support for 2 CPUs. I might be satisfied with an i9 but I don't think it supports ECC memory which I want. 3. Large amount of ECC memory. At least up to 128 GB for future expansion. ECC is pretty necessary when going with large amounts of RAM. 4. Upgradeable SSD slots, at least 4 for RAID configurations. At least 4 TB. 5. Thunderbolt 3. At least 6 ports, at least 3 independent controllers for maximum bandwidth. 6. Quiet and relatively small case. I love the Mac Pro trashcan but I don't mind larger for more expandability. Enough cooling to never throttle. 7. Dual 10 Gb ethernet. I run lots of VMs. These requirements are all in service to having 2 or more VMs running simultaneously. For Thunderbolt, each controller is capable of running two ports, so if we did get 6-8 slots, we'd get 3-4 controllers. I think they can deliver that "relatively small case" as well. We basically need something modern like the trash can, but more modular and quiet. Can't wait to see what comes of it! With so many different needs, both real and imagined, the only way to build a modular Mac Pro would be to build it like a Lego model starting with a hefty power supply at the bottom followed by a CPU box that can be updated intact every few years, a RAM box followed by a GPU box. I presume the CPU box would also contain I/O ports. Storage is something that might best be served by third-party vendors with Apple only providing a simple SSD box for boot up, applications and limited user storage. Each box needs to be upgradeable independent of the other boxes, which can be difficult when need bus designs are released. RAID storage is always the way to go when the user has large storage requirements. I wanted a blade server from Apple, which never happened, but this might be the best way to approach a modular Mac Pro. Putting all of this in a small footprint will be difficult, especially when people want upgrade ability. Sockets and interconnects are not space savers. The biggest issue is to just keep the machines updated at a 12 to 18 month cadence, preferably 12. They are even fine with keeping the 2013 Mac Pro industrial design as long as it is updated with state of the art parts. This is basically the iOS device model strategy. Instead of upgrading the machines internally, people sell old models to buy new models. Maybe Apple could have a convenient exchange program. Minimally, 1 Xeon and 1 Vega means 150+300 = 400 W of power for those two alone. I/O, RAM, storage is going to be another 100 W. So the next box needs to be handle 500 W. Give it 50% margin and make a 750 W box. This way, the box could be retrofitted for 2 250W GPUs, or whatever unforeseen new capability the box wasn’t designed for. There was zero excuse for painting themselves into a thermal corner. The internally expandable box is great for hobbyists and tinkerers, but Apple could just easily fall into the same rut of not updating that type of design with state of the art components. It’s really not the box that is the problem, it’s Apple’s commitment to continually offer state of the art workstation level machines. I would love an edge to edge display like that! Even for someone who has a Mac mini or MacBook, MacBook Pro that would be an awesome display! I wish the iMac would look more like this too but thats for a different discussion. Of course it also helps to have something to upgrade to as well. What I don't want to see if Apple updating the Mac Pro for the sake of updating it. Some either forgot or have never experienced the PowerMac G4 days where Apple would release this minuscule update basically just for the sake of updating it and sometimes the outgoing model was technically faster than the new model in certain applications. This constantly pissed customers off so if Intel doesn't have anything worthy of upgrading to for 2yrs then I can understand Apple waiting. Is it really worth Apple's time putting a new Xeon chip in thats only marginally faster just to shut people up? "we wouldn't be terribly upset of HDMI was removed, as well as two of the USB 3.0 ports." Well, I would be upset. My two NEC 30" monitors each require a USB port, and the USB port cannot be a port on a USB hub, they each must be a port directly on the 2013 Mac Pro. Also, the Apple DVD drive requires a USB port directly on the Mac Pro. So I'm left with just a single USB port available as it is. If my next computer doesn't have at least 4 USB ports I'll have to buy new monitors just to be able to connect them. Originally, Apple hadn't updated the "cheese grater" Mac Pro because they were getting ready to announce the new cylindrical Mac Pro. That Mac Pro launched, and it was fine at the beginning, but then they noticed all the issues that came up with it. Notably no modularity, not enough power, among other issues. It was then they decided, again, to redesign it. So instead of limping the current one along, they left it as-is and promised the new one soon. Obviously, they could have handled this better. They could have updated the basic specs on the machine to keep it current. I think if they nail the design on the new one, and they plan to actually keep it around, then it will be more likely for them to keep it updated. This is the start of a good list. We have been running our 2012 Pro very successfully over the years, and there are capability reasons we haven't upgraded. 128 GB RAM is the least on the maximum end - we've been running 128 for 4? years now, and i wish we could go higher. Apple has lagged so far behind in regards to SSD capacity. Our heaviest users have remained (for their mobile computers) on old form factor MacBook Pros with 2.5" drives solely because Apple doesnt have a 4 TB option, and we can throw in a Samsung 4 TB SSD with no issue. This shouldn't happen in a MacBook Pro, and cannot be acceptable in a Mac Pro. The capacities exist, allow a customer to pay the money to get it. Thunderbolt is an "of course"
The case should fit in a standard rack, or at least have removable appendages that allow it to be bolted in (i am looking at you, 2012 aluminum case with non-detachable feet & "arms"
GPUs should be current & upgradeable. It is our least-necessary bit, but i understand the needs of others. FCP rendering has proven fast enough on the workstations for us, and storage & imaging database are the biggest resources hogs on our 2012. IMHO whatever they come out with must be able to take COTS (Commercial Off-the-Shelf) AMD and/or nVidia PCIe cards. Whether in the main chassis or in an eGPU chassis isn't that important. The graphics card is almost always the first thing to become obsolete in a pro computer. Save very obsolete graphics cards in the 2013 Mac Pro, it still is a pretty fast platform, even after 5 years. Like I said in the article right after you ended the quote. There are plenty of cables. You don't need new monitors. You just need a new cable. I believe those monitors use a USB Type-B to USB Type-C. Like this one on Amazon. Pick up a pair of these for $15 bucks, heck, even pick up some nice USB-C HDMI cables. Then you don't need the HDMI either. You could use one USB for the SuperDrive, leaving you a second spare one. However, the SuperDrive is perfectly fine to connect to your Mac using an adapter instead of a hub. Apple sells their own USB-C to USB-A adapter, or you can find cheap ones on Amazon. With this setup, you can connect everything to a new Mac Pro, with only a single adapter needed for the SuperDrive, and not a single USB-A used. To use an automotive analogy, it's like they want to create a more flexible platform -- something that can be used for cars, cross-overs, and SUVs. But with the 2013 Mac Pro, they came up with a platform that could only be used to make a sports car. So, I'd guess it will be a little bigger, a little less compact. There could BTO options to have one or two CPUs, with a wide range of core counts. There could be BTO options on GPUs, maybe 1 or 2, maybe just 1 but with a wider range of options. I'm not confident that Apple will support the user opening the case for anything other than RAM upgrades, though. While such upgrade might not be supported, though, it might be feasible, particularly for a group like OWC. New models aren’t for people who have 1, 2, or 3 year old machines. They are for people who have older machines nearing end of life, and buying a machine that is current year state of the art instead of 2 years old is a more attractive option. Apple could also follow the waterfall sales strategy from iOS devices too. They could reduce the price of older Mac models, keep them in the lineup, when new models come. Not a typical sales strategy for PCs though, but Apple does do this for some Mac models. I've really enjoyed the 2013 MacPro's just fine, as they are great work horses! We use six of them. I had no choice but to enclose them in a 3rd party chassis so I could include a fiber card, AJA capture card, and BluRay and DVD burners. I like my edit suites clean and cable free, so dangling a bunch of external peripherals around was not an option. HDMI, Thunderbolt and dual ethernet are all essential too. I was really hoping to purchase 6 new ones this year, but have now put that on hold until 2019. Heres hoping it doesn't end up being December 31st of 2019. So bottom line I hope Apple listens to professionals like Alex Lindsay and others and not someone who built a hackintosh with stuffed in parts from Fry’s and calls themselves a pro user. Don’t fall into the specs trap. Rest assured, though, that whatever Apple comes up with will be torn to shreds by the Internet technorati and their constant negativity. Can you tell I’m a bitter cynic when it comes to know-it-alls who know nothing? 2013: 2013 Mac Pro: new Mac Pro design! 2014: Not looking promising for updating CPUs and GPUs. Uh, no new 135W GPUs from AMD? 2016: iMac Pro continues development; Mac Pro users provide feedback, like why no VR support, or no GPU compute? 2018: The iMac Pro is our Pro desktop offering at this time, please buy it. eGPU supported. 2019: new Mac Pro! New monitor! The issue is the 5 to 6 years of misreading the market spanning 2011 to 2017. All the issues with the 2013 Mac Pro were immediately discussed post WWDC 2013 in these very forums and elsewhere. I thought they’d be ok if they updated it fairly often. Low and behold, they didn’t which I think would come as surprise to virtually every single person in 2013. Even the people who didn’t like the design, thought it was thermally limited, would be surprised that Apple didn’t update it. Heck, I thought even if AMD or Nvidia couldn’t produce lower power parts, Apple would be able to leverage Samsung & TSMC 20 nm Fabs used for Apple’s ARM chips to get exclusive low power GPU parts. Nope. I don’t even understand the decision to not do a Thunderbolt 2 4K monitor. They would have sold millions of them to Mac laptop owners. Monitor sales would have been a multi billion dollar business by itself. So regardless of what the design of the 2019 Mac Pro is, the important thing will be what happens in 2020 and 2021. I think part of the issue is that the term is broad. There are graphics professionals like Alex Lindsay, or folks working at National Geographic, or those in huge movie studios. Then again, that customer base is a much smaller pool than what some would call "pro-sumers". This can be someone in his bedroom using photoshop because that is his home office where he edits wedding photography he shoots. Or what about me? I work on video for a living, doing freelance work (commercial and personal), as well as multiple YouTube channels. I also do lots of front-end web development and design. That isn't editing a blockbuster or working at Google, but it is how I make my living. The pro-sumer market is much bigger than the highest end professionals, and they tend to buy a lot more machines. Those that are striving to be better, and want a powerful machine to help them. I'm not saying Apple needs to cater to that market exclusively, but they need to consider it. Have a range of machines that will work for those pro-sumers, as well as industry leaders.